Stop me if you've heard this one. 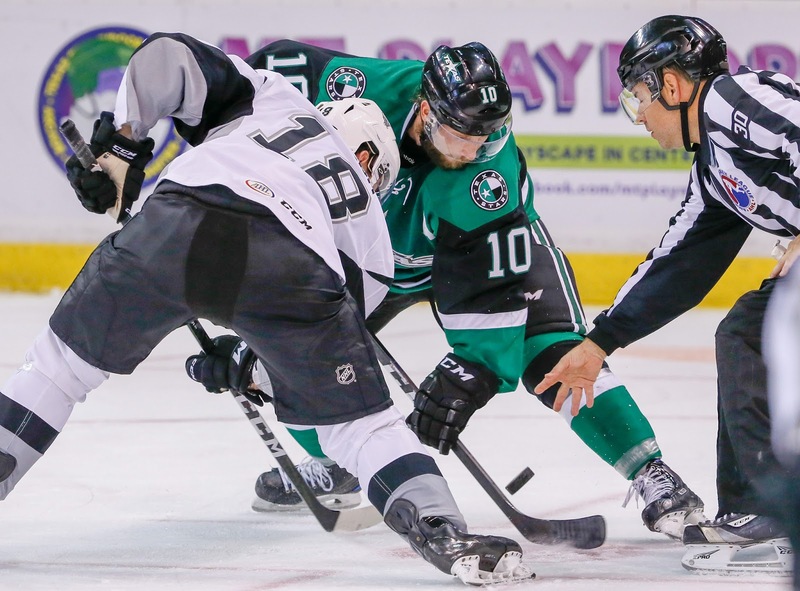 Texas and the San Antonio Rampage will play a home-and-home series as their preseason slate. Games will be September 28th and 29th with the first game in San Antonio. Note that the Saturday game at Cedar Park will start at 5 PM. The Texas Stars, American Hockey League affiliate of the NHL’s Dallas Stars, announced Friday the team will play a preseason home-and-home series against their in-state rival, the San Antonio Rampage, prior to the start of the 2018-19 campaign. Texas will visit San Antonio on Friday, Sept. 28 at 7:30 p.m. CT at AT&T Center for their first exhibition matchup then the two teams come to H-E-B Center on Saturday, Sept. 29 at 5 p.m. CT to close out the home-and-home series in their final preseason tune-up. Tickets for the Sept. 29 preseason game at H-E-B Center will go on sale at a later date. In a move they announced with a single tweet on Twitter, the Texas Stars have re-signed forward Sam Laberge for the coming season. Laberge played 66 games with Texas in his rookie season. The Texas Stars, American Hockey League affiliate of the NHL’s Dallas Stars, announced Monday the team has signed forward Samuel Laberge for the upcoming 2018-19 season. Laberge, 21, appeared in 66 games for the Stars last season and tallied 15 points (7-8=15). The 6-foot-2, 200-pound forward also competed in 13 playoff games for Texas with a goal and two assists. His lone playoff goal was a double-overtime winner in Game 3 of the Stars’ opening round series against the Ontario Reign. Prior to his rookie season, Laberge (luh-BERZH) spent four seasons with the Rimouski Oceanic of the Quebec Major Junior Hockey League and recorded 120 points (55-65=120) in 166 career games. The Chateauguay, Quebec native was a member of Rimouski’s QMJHL championship team in 2014-15 and also played in four Memorial Cup games that season. The Texas Stars continue to build the bench as rookie forward Brad McClure joined the club today. The Minnesota State-Mankato alum played 159 games across four seasons, earning 91 points and serving as team captain last season. McClure is in very good company among the Texas Stars as a former Mankato forward. Travis Morin attended the school as well. The Texas Stars, American Hockey League affiliate of the NHL’s Dallas Stars, announced Wednesday the team has signed rookie forward Brad McClure to an AHL contract for the upcoming 2018-19 season. McClure, 24, begins his professional career after completing a four-year career at the Minnesota State University-Mankato from 2014-2018. In 159 career games for the Mavericks, the 5-foot-11, 191-pound forward tallied 91 points (45-46=91) and served as the team’s captain during his senior season. Prior to college, McClure also spent two seasons with the BCHL’s Penticton Vees with 126 points (69-57=126) in 111 career games, including an 80-point campaign in 58 games in 2013-14 (41-39=80). Defenseman Dillon Heatherington is in the plans for next year as the Dallas Stars inked the 23-year old to a one-year, two-way deal this afternoon. Heatherington spent most of the season with Texas and was a mainstay on the blue line in the playoffs. Paired with Brent Regner, "Heater" was used some of the toughest situations of the postseason run. He now has two Finals runs on his resume with his win in Lake Erie in 2016 and this past season's run with Texas. Dallas Stars General Manager Jim Nill announced today that the club has signed defenseman Dillon Heatherington to a one-year, two-way contract. Heatherington, 23, split the 2017-18 campaign between Dallas and the Texas Stars (AHL). He appeared in six regular-season NHL games with Dallas, notching one point (0-1=1) and 26 penalty minutes. The blueliner made his NHL debut on Jan. 18 against Columbus, logging two penalty minutes. He also appeared in 55 regular-season games with Texas and registered 17 points (3-14=17) and 47 penalty minutes, while finishing third among team defensemen and seventh among all club skaters with a +6 plus/minus rating. Heatherington also skated in 21 games during the 2018 Calder Cup Playoffs and tallied three assists (0-3=3) with 18 penalty minutes. Heatherington has appeared in 181 regular-season AHL contests with Springfield, Lake Erie/Cleveland and Texas. Over his four AHL seasons, he has recorded 51 points (9-42=51), 148 penalty minutes and a +18 rating. The defenseman has also tallied six points (0-6=6) in 36 career Calder Cup Playoff games. The 6-foot-4, 215-pound native of Calgary, Alberta was originally selected by Columbus in the second round (50th overall) of the 2013 NHL Draft. He was acquired by Dallas via trade in exchange for Lauri Korpikoski on March 1, 2017. 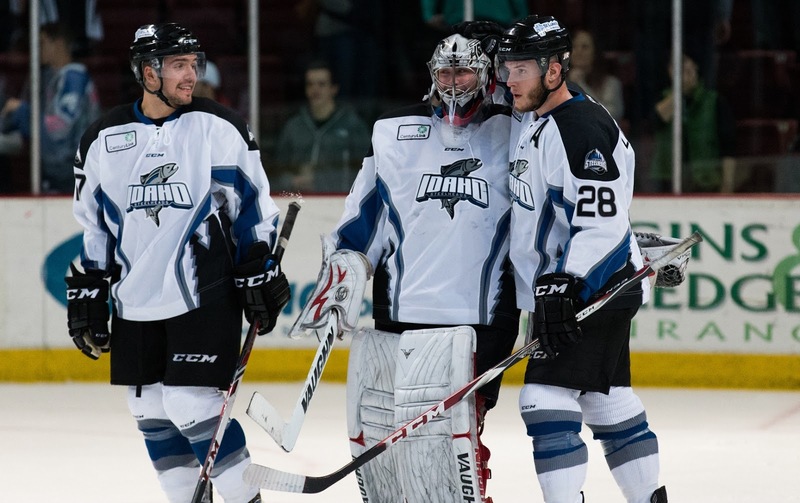 The Idaho Steelheads will continue as the ECHL affiliate of the Dallas Stars organization for the coming two years. There was no doubt the affiliation would continue next year with training camp in Boise in just a few months. Idaho is a strong competitor in the ECHL, currently owning professional hockey's longest playoff streak at 21 straight seasons. Idaho has advanced to the Kelly Cup Final three times when affiliated with Dallas, winning twice. The last time they won was under the leadership of Derek Laxdal, now the Texas Stars head coach, in 2007. 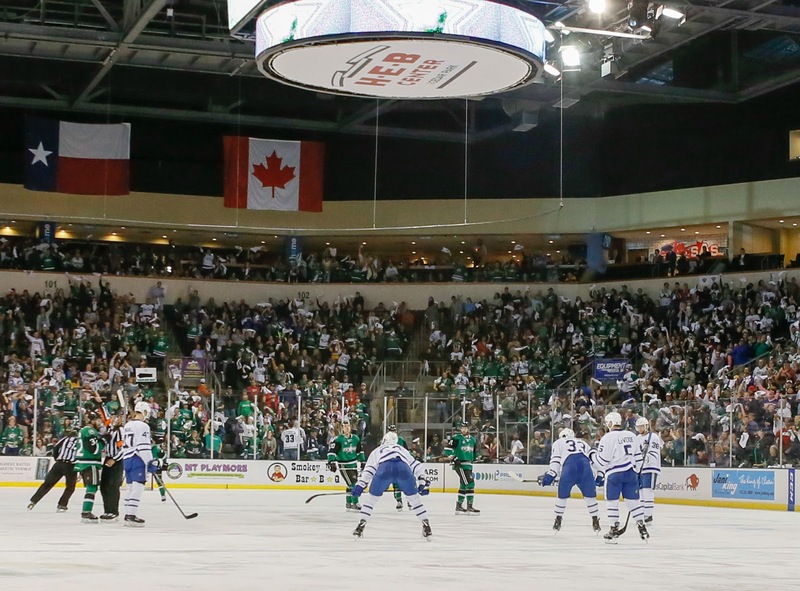 The Dallas Stars announced today that the club will renew its affiliation with the ECHL's Idaho Steelheads through the conclusion of the 2019-20 season. 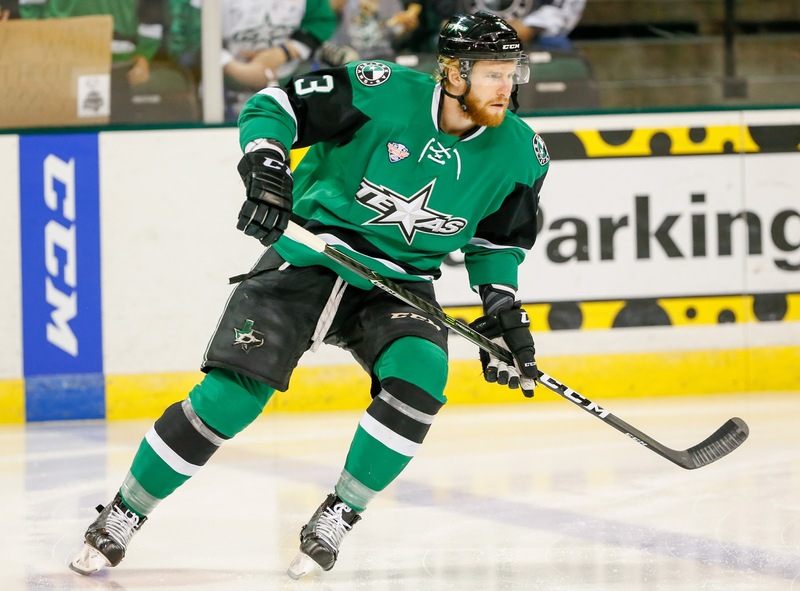 As the week closes out, Dallas made a few moves involving once and future Texas Stars. First of all, goalie Philippe Desrosiers was signed to a one-year, two-way deal. Desrosiers is coming off his entry level contract and was a restricted free agent. Dallas did qualify the young goalie, but he spent the entire year in the ECHL. Desrosiers will have to truly up his game this coming year as Colton Point is coming out of college and looks to already be ahead of him on the depth chart. Note that Desrosiers does have the option to refuse assignment to the ECHL now that he is not on an entry level contract. Second, Jason Dickinson was signed to a one-year deal. There was no doubt that Dickinson would be signed, but the question was around the 'wayness' of the deal. The contract is a one-way, which means that he is unlikely to return to the Dallas Stars. 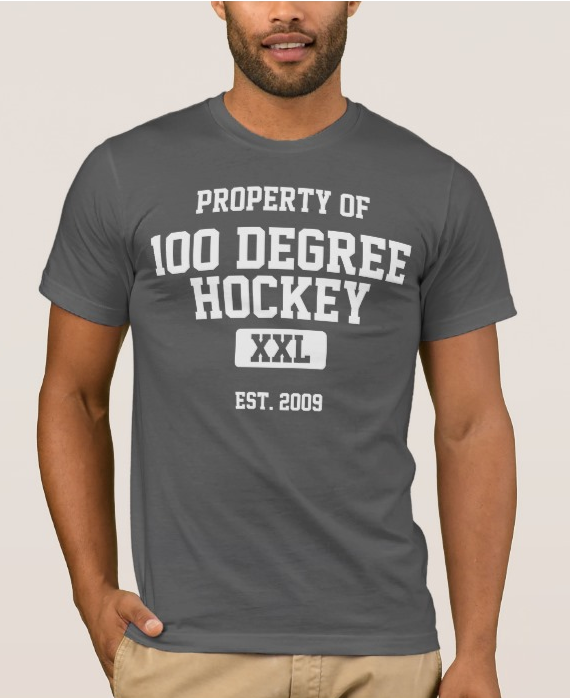 Effectively, he has graduated to the NHL. Third, Adam Mascherin has been inked to a three-year entry-level deal. He was originally drafted by the Panthers in 2016 but did not sign and reentered the 2018 draft. Dallas picked him up in the 4th round. Given that he is an older pick, he is immediately eligible for play in the AHL. 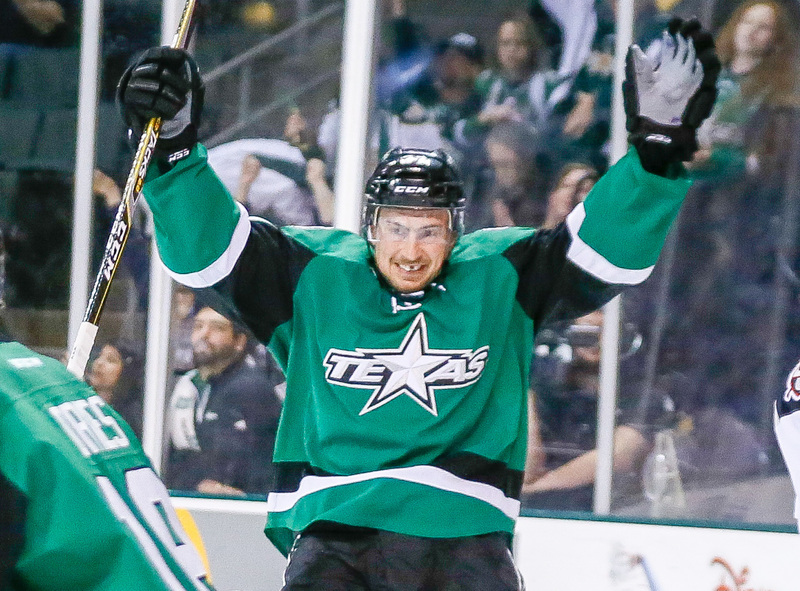 Finally, former Texas Star Devin Shore was also re-signed by Dallas on a two-year, one-way deal. Original Texas Star Greg Rallo has retired and heads off to the coaching ranks. He will join the coaching staff of Karl Taylor in Milwaukee. Rallo has had three stints with the Texas Stars, reaching the Finals with the club in two of them. As an original Texas Star, Rallo was part of a great line with Aaron Gagnon and Francis Wathier during the regular season and played with Travis Morin often in the playoff run. He went to the Florida Panthers after a few years and got a chance at the NHL, playing 11 games for the Panther but spending most of his time with the San Antonio Rampage. Rallo rejoined Texas in 2014-15 and played for two years here before jumping to Europe. In the DEL, he suffered injury and was limited to 45 games. He was a rare return from the European ranks when he signed with Texas in 2017. The veteran rule limited his play time in Texas and he did not play a single game in the Calder Cup run. However, Rallo did act as a third coach for the team, working with the black aces in the secondary practices that would occur after the game group. This is where he picked up tons of hands-on coaching experience and clearly caught the eye of Karl Taylor, who added him to the staff in Milwaukee this week. Rallo finishes his Texas Stars career with his name all over the leaderboard. He is tied for second place in goals scored with Colton Sceviour. He's seventh in assists, fourth in points and second in power play goals. Texas will face Karl Taylor and Rallo eight times this coming season as the Stars join the Milwaukee Admirals' division. On a personal note, I wish Rallo the best of luck in his future endeavors. He was one player who consistently said hello no matter the game outcome or his status in the lineup and recognized the constant presence 100 Degree Hockey has had at the rink since the beginning. Texas dropped their season schedule this afternoon along with the rest of the American Hockey League. The Stars move to the Central Division this season, where every single team will play the same 76 games. All the Pacific teams will continue to play 68, including new addition Colorado. Bizarrely, the Eagles will not play Texas next season. Also of note, Texas will shift all weekday home games forward half an hour, putting them at 7 PM, same as Saturday games. This was the schedule in the playoffs, and it worked well. There is a lone home game on Sunday this year in March, which will be played at 5 PM. Texas will have one day game in Chicago in January. Texas will see each team in the Central eight times with the Pacific matchups ranging from zero (Colorado) to four each (Tucson). There are two 3-in-3s, and they come back to back in the season November 23-25 and November 30-December 2. The Texas Stars, American Hockey League affiliate of the NHL’s Dallas Stars, announced Wednesday their 76-game schedule for the upcoming 2018-19 season. The franchise will kick off its 10th anniversary season of play at H-E-B Center at Cedar Park with Opening Weekend on Friday, Oct. 5 against the Grand Rapids Griffins and Saturday, Oct. 6 against the Milwaukee Admirals. The complete schedule and more information are available online at http://www.texasstars.com. Single-game tickets for all 38 home games will go on sale at a later date this summer. Prior to the season opener, the Stars will raise their Western Conference Championship banner after advancing to last season’s Calder Cup Finals. The 2018-19 campaign will conclude Saturday, April 14 against the San Antonio Rampage on Fan Appreciation Night. New this season, all Friday and Saturday home games will begin at 7 p.m. CT at H-E-B Center. The Stars will move to the AHL’s Central Division this year to face the Rampage, Griffins, Admirals, Chicago Wolves, Iowa Wild, Manitoba Moose and Rockford IceHogs. 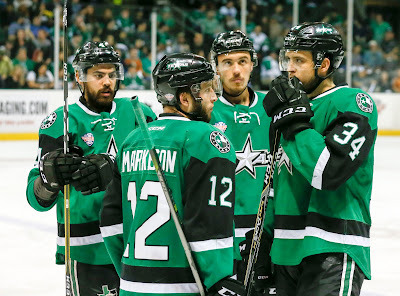 The Stars will visit the IceHogs on Saturday, Oct. 13 for the first meeting between the two teams since Game 6 of the Western Conference Finals when Texas eliminated Rockford to advance to the Calder Cup Finals. The Stars open their season series against the Wild at home on Oct. 19 and 20. Their first matchup against the Wolves is at home on Oct. 26 and the Moose visit on Nov. 14 for their first game against the Stars. A full promotional schedule of ticket specials and theme nights for home games this season will also be announced at a later date. In total, the Stars play 27 of their 38 home games on Friday or Saturday. Eight games will be played on Wednesday, two on Thursday and one on Sunday. 13 different teams will visit H-E-B Center this season. The team’s most common opponent is San Antonio with 14 meetings between the two rivals. Of their 76 total games, 62 will be played within the Central Division for the Stars. The other 14 will be played against the AHL’s Pacific Division (Bakersfield Condors, Ontario Reign, San Diego Gulls, San Jose Barracuda, Stockton Heat and Tucson Roadrunners). The one Western Conference team the Stars will not face this year is the expansion Colorado Eagles. Texas will play six of its first nine games at home through October and wrap things up hosting four of their last five in April. March is the busiest month for the team with 15 scheduled games. The longest road trip of the season is a five-game, 10-day stretch along the west coast in January. Prior to that, the Stars play a five-game stretch to begin January for their longest homestand of the season at H-E-B Center, and the team will enjoy a 25-day period over December and January where they do not leave Central Texas. Only one three-in-three weekend is scheduled this year for Nov. 23, 24, 25 – all against San Antonio. The Texas Stars announced another AHL deal today with forward James Phelan officially joining the fold. Phelan's signing was announced by his QMJHL team back in April, but the Texas Stars would not confirm the signing at that time. The Texas Stars, American Hockey League affiliate of the NHL’s Dallas Stars, announced Thursday the team has signed rookie forward James Phelan for the upcoming 2018-19 season. Phelan (FEE-lan), 21, begins his pro career after spending the previous five years in the QMJHL. The 5-foot-11, 185-pound forward tallied 191 points (86-105=191) in 321 career games played between the Shawinigan Cataractres (2013-2016), Victoriaville Tigres (2016-17) and Moncton Wildcats (2017-18). The Laval, Quebec native also competed in Development Camp with the Dallas Stars earlier this summer. Remi Elie was qualified by Dallas a few weeks back and has now agreed to terms on a one-way contract at $735,000 for the coming season. The contract structure makes it unlikely he will play with the Texas Stars again. 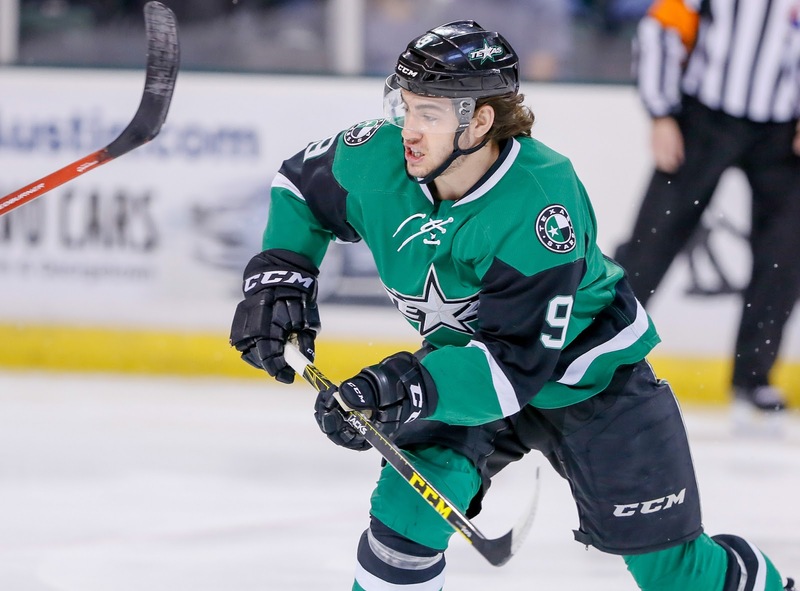 Dallas Stars General Manager Jim Nill announced today that the club has signed left wing Remi Elie to a one-year, $735,000 contract. Elie, 23, skated in 72 regular-season games for Dallas during the 2017-18 season, posting career-highs in points (6-8=14), goals (6), assists (8) and games played (72). He was tied for fifth among Stars forwards and shared seventh among all team skaters with 101 hits. The forward also appeared in four regular-season games for the Texas Stars (AHL), potting one goal (1-0=1). During the 2017-18 postseason, Elie tallied nine points (2-7=9) in 19 Calder Cup Playoff games, helping Texas reach the Calder Cup Final against the Toronto Marlies. The forward has appeared in 90 career NHL games, all with Dallas, and has registered 21 points (7-14=21) with 26 penalty minutes. He has skated in 121 AHL contests over three seasons, posting 46 points (16-30=46) with 94 penalty minutes. In 23 career Calder Cup Playoff games, Elie has nine points (2-7=9) and 10 penalty minutes. The Texas Stars wasted no time finding a new assistant coach to join Derek Laxdal's staff. Bob Jones joins Texas coming off three seasons as head coach of OHL Oshawa. Before that, he was an associate coach and spent one season as head coach of the Windsor Spitfires. That run included two OHL championships headlined by leading scorer Taylor Hall. Jones was drafted in the ninth round by the Red Wings in 1989. That year, the draft went out to 12 rounds. He played just over 100 games in the AHL and IHL from 1990-92. Jones missed the 2017-18 season with Oshawa after suffering a ruptured colon in June 2017. Jones was given a 20% chance to survive. He recovered but ultimately did not coach in the 2017-18 season for Oshawa. You can read more about the illness and his decision not to return to Oshawa here. Dallas Stars Assistant General Manager and Texas Stars General Manager Scott White announced today that the club has appointed Bob Jones as Assistant Coach of the Texas Stars, Dallas' top development affiliate in the American Hockey League (AHL). Jones replaces Karl Taylor, who was named the head coach of Milwaukee Admirals (AHL) on June 29. Jones, 48, spent the last three seasons as head coach of the Oshawa Generals of the Ontario Hockey League (OHL). Over that span, he amassed a 103-85-16 record and qualified for the OHL Playoffs in all three campaigns with a 7-14 postseason record. Prior to his time in Oshawa, Jones spent eight seasons behind the bench for the Windsor Spitfires. In his time with the Spitfires, the club won back-to-back OHL championships (2008-09, 2009-10) and qualified for the postseason every year. He served as an associate coach for seven seasons (2007-10, 2011-15) and was the team's head coach for the 2010-11 campaign. In his lone campaign as head coach in 2010-11, Jones compiled a 39-23-6 regular-season record and helped the Spitfires reach the third round of the 2011 OHL Playoffs. "Bob has been very successful in junior hockey for two decades and we are pleased to welcome him to the Dallas Stars organization," White said. "He has over 21 seasons of coaching experience and his wealth of knowledge and ability to develop young players will be a tremendous asset to our organization." He joins Texas Stars Head Coach Derek Laxdal and his staff in Cedar Park, Texas. During the 2017-18 season, the Texas Stars won the AHL's Western Conference and made the franchise's third Calder Cup Finals appearance over the last nine seasons. Jones also has served in numerous coaching capacities across the OHL including as an assistant coach for the Sudbury Wolves (2004-07), an associate coach for Toronto St. Michael's Majors (2000-01, 2002-04), an assistant coach for the Brampton Battalion (1999-00) and the Sault Ste. Marie Greyhounds (1995-99). The native of Sault Ste. Marie, Ontario was originally drafted by the Detroit Red Wings in the ninth round (179th overall) of the 1989 NHL Draft and played six seasons of professional hockey with the Adirondack Red Wings (AHL), San Diego Gulls (IHL), Fort Wayne Komets (IHL), Muskegon Fury (CoHL) and the Saginaw Wheels (CoHL). Prior to turning pro, Jones played five seasons of junior hockey for Sault Ste. Marie (OHL). Dallas Stars general manager Jim Nill wasted no time in boosting organizational depth when the July 1 free agency window opened in the NHL. As a result, the Texas Stars roster has experienced an overnight facelift and will look markedly different when they take the ice in October. Here are the notable transactions up until day 2 of free agency and how they figure to impact the Texas Stars. The promising power forward who joined the Texas roster prior to the start of the Calder Cup playoffs will remain a Star with a two-year ELC. Though he only amassed four points in 22 playoff games, L'Esperance was a key cog that played up and down the lineup and quickly gained the trust of the coaching staff. His relative versatility will help him be a fixture in Cedar Park next season. Having played against Mersch in their first round playoff series against the Ontario Reign, the Texas Stars know they are getting a winger who can play both sides, use his 6'2" stature to be a net front presence, and provide plenty of scoring. The Illinois native put together a 49 point 2017-18 campaign while playing within the compressed 65-game California schedule. He signed a two-year, two-way contract with the Stars. Another player the Stars are familiar with from the postseason, Hanley tallied four points in nine games for his Tucson Roadrunners during their playoff run. His 31 regular season points helped also helped them run away with the Pacific division early. The left-handed shot has signed to a one-year, two-way contract and seems a good bet to replace Andrew Bodnarchuk. The former captain of the Syracuse Crunch has been signed to a one-year, two-way deal and brings an impressive resumé with him. With 366 career games in the NHL, Condra is a great piece to help replace what the Stars lost in the departures of Curtis McKenzie and Brian Flynn. A point per game player in Syracuse's 2016-17 Calder Cup run, that saw the Crunch come up just short, Condra could be a huge boon to high end prospects like Roope Hintz. The 2016 5th round pick of the Dallas Stars has left Colgate University to sign a three-year ELC. The signing essentially spelled the end for Mike McKenna's time in Cedar Park. Point will battle with Landon Bow for the lion's share of time in the crease and will give goalie coach Jim Bedard an exciting project in which to invest. Here are the notable players that have signed elsewhere during free agency. Texas Stars captain for the 2017-18 season and team leader in playoff scoring, McKenzie was likely never going to get the opportunity he probably deserved in Dallas. He sought potentially greener pastures with the Vegas Golden Knights. It remains unclear whether he will play for their affiliate Chicago Wolves or compete for a spot in their bottom six. His departure will leave a massive void in production, leadership, and professionalism that some of the younger players with have the opportunity to replace. The sneaky-good veteran forward was third in team scoring during the 2017-18 regular season and parlayed that production into a contract with the St. Louis Blues. 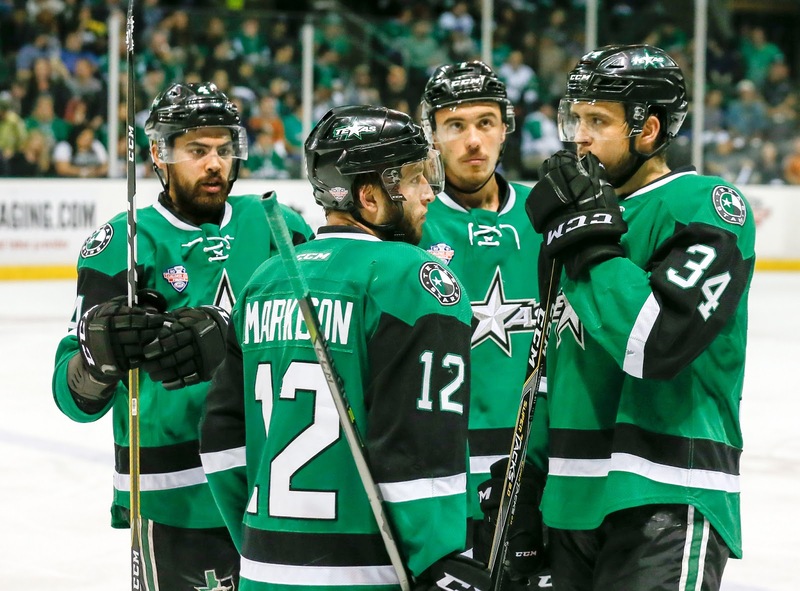 Having to move only about an hour south to San Antonio, Flynn projects to be a thorn in the side of the Texas Stars when they face the Rampage over a dozen times next season. An instant fan favorite with the Texas Stars fanbase, McKenna was the primary reason the Texas Stars came within one game of winning the Calder Cup. Keeping in step with his journeyman identity, he signed a one-year deal with the Ottawa Senators to help bolster their affiliate team in Bellville. With his departure, the Stars will focus more on goaltender development.